Oh, Secretary DeVos, you have it all so wrong. I have attended colleges and universities, public and private, as a student in California and New York. 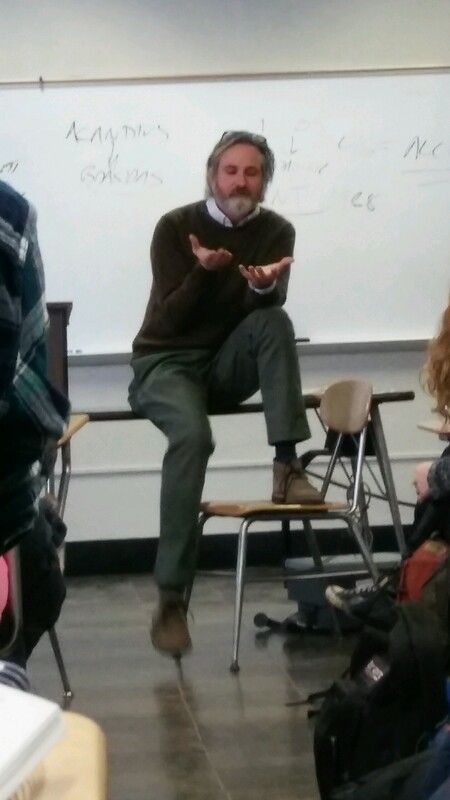 I have taught at colleges and universities in Montana, Texas, and New York. I have spent more than three decades, as student and a professor of American history, on college campuses. My colleagues and I have, I will admit, told students to do their assigned work. We have told them that they need to communicate clearly and effectively with evidence to support their reasoning. Sometimes we complain that they do not work hard enough or think with enough discipline. But we do not tell our students what to think. Indeed, there would be no better way to lose an audience of 18-22 year old young people. 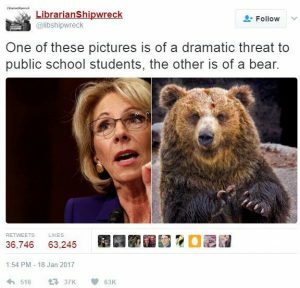 I have no idea how much time Betsy DeVos spends in college classrooms, but I can say that higher education as it actually is practiced bears little resemblance to the dystopian vision she outlined last week and that is echoed so often in the right-wing media. In history and the liberal arts, we pose big questions over which great minds around the world from many cultures have wrestled with for millennia. We study continuity and change, measured across time and space, in peoples, institutions and cultures. We urge students to be curious and hard-working, critical but kind. But we do not tell students what to think. We ask them to use their imagination and their reason. We expect them to argue—to investigate problems, gather evidence, consider the scholarship, and advance a thesis with confidence and clarity. We urge them to question everything, to challenge assumptions, to demand evidence, and to be intellectually fearless. We demand that they think. Are there incompetent professors? Or ideologues in the university classroom? Sure, there are a few, and as many on the right as on the left in my experience. But they are a tiny minority, as they are in any line of work. There are, after all, incompetent and close-minded politicians, plumbers, and cabinet secretaries, as well, and “the faculty” is generally a group of fiercely independent and open-minded thinkers. justice, and the relationship between law, power, and liberty, to name a few. The students’ opinions cross the ideological spectrum, but all understand that they must explain why they believe what they believe, and the evidence and experience that led them to those beliefs. And they must consider the ideas of great thinkers along the way, some of whom will challenge all that they believe to be true. Education can be an unsettling experience. Students who really want to be educated will be challenged. Betsy DeVos seems to look on all of this with dread. She wants college students to join in “the fight against the education establishment,” to root out those phantoms “who say that if you voted for Donald Trump, you are a threat to the university community.” She believes that conservative students are under siege, assaulted by a college community that pays little heed to their First Amendment rights. Nonsense. And the few exceptions she might trot prove no rule. 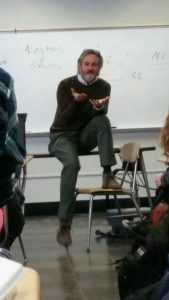 Professors are as much a threat to free thought on college campuses as Grizzly Bears are a threat to children in elementary schools. Education is essential for the functioning and survival of a republic. STEM education is important. We all know that. But a thriving democracy requires informed and questioning citizens, capable of thinking for themselves, assessing evidence, and dismantling the cant of demagogues and press secretaries. This is precisely what education in the liberal arts provides: students who can write, who can reason, and who can debate; students who can cut to the quick of an argument and insist on seeing the evidence and demand answers. These are the sorts of people, judging by Secretary DeVos’s demeanor at her confirmation hearing, that she worries about the most. Spend some time on a college campus. Listen to what students talk about when they talk about their classes. Read what they write and what their professors write. Look at what they learn. Do so broadly, and with an open mind. You will see, then, that Secretary DeVos needs to go to school.